Celebrate in style with completely personalised, bespoke chocolates tailored specifically for your party or special event: be it a significant birthday/anniversary celebration, retirement do, baby-shower, housewarming, religious rites of passage... we will do our best to make your party extra special. Explore our Chocolate Cart, Table Centrepieces and Bespoke Gift options and then contact us to arrange a free, no obligation consultation. Our team of chocolatiers are happy to guide you through all the options. 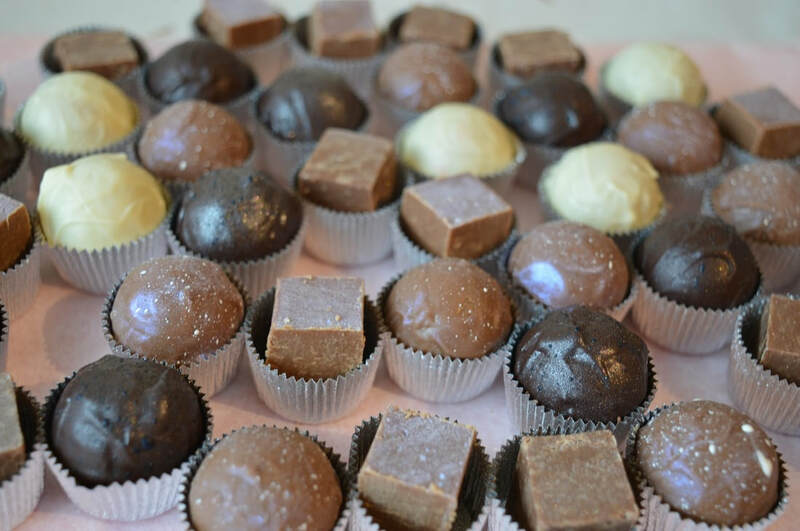 Starting from just 60p per chocolate our individually handmade chocolates will be a real talking point with your guests - and we promise they'll be a popular choice! ​Choose a range of flavours, colours and styles to complement your venue, style and decorations. You could add our chocolates to your table centrepieces, have your own chocolate cart or even a chocolate buffet. We offer a range of tailored, bespoke chocolate gifts to thank those people who helped make your event special. Be it a box of pralines for a nut lover or a chocolate frog for a frog fanatic we can help you say a personal 'thankyou'. ​Each gift will be hand made and specifically personalised with a message of thanks to the recipient. The chocolate gift itself can be tailored to match the colours and the style of your event. They will be lovely memorable presents for the people who have helped you organise the party. Our bespoke chocolate gifts are also perfect as extra special wedding favours. What better way to say thankyou to those who've gone the extra mile to support you in the months of planning to ensure your wedding day is the day that you've always dreamed of. Looking for a hand-crafted chocolate show stopper to add a real 'wow' factor to your party? We can work with you to design an extra special piece of chocolate art work for your memorable event. ​You can find more information about our chocolate wedding favours here.